Imagine if you had the means to invite one of the world’s greatest pianists into your home to entertain your guests at a dinner party. It’s an indulgence open to the well-off host, but unattainable for most of us. Now put yourself in the position of someone who can afford a Steinway grand piano. That’s a broader pool, with the Steinway not such a rare luxury, say, for people dipping into a big pension pot, or downsizing from a large house. You are now able to “hire“ Lang Lang, Diana Krall, Harry Connick, Jr or Billy Joel. They will “play”, without tiring, from a repertoire of over 3000 pieces throughout the courses. This eminent guest doesn’t need to be fed, but he or she must be programmed. There’s the clue. Note-perfect pieces called up by a touch of an iPad screen, and performing themselves with a magical precision, exactly as the virtuouso played them earlier when their performance was electronically captured. The keys are depressed by invisible fingers, the pedals moved by unseen dancing feet. All the performance lacks is the physical presence of the player. Our mental astonishment threshold bar is set so high these days, with a never-ending flood of high-tech gadgetry, that such an idea may not sound so remarkable. Wasn’t the original piano roll developed as long ago as 1896? And we can hear the calliope or steam organ wheezing away at any good circus these days. But to describe this as simply the last stage of the evolution of the self-playing piano, which began with the launch of the piano roll concept in the Victorian era, is to do grave injustice to the Spirio. This is a technological Everest beyond anything that has come before in musical performance. 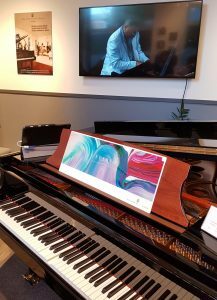 Music is performed by Steinway’s pedigree stable of pianists, who represent a range of genres, including rock, pop and jazz as well as classical music (there are 1800 pianists on the Steinway & Sons artist roster), in the highest possible resolution. The electronic system then reproduces it to the last delicate nuance, from the softest trills to the most thunderous fortissimi, with the keys moving to the precise force with which they were originally depressed. The software can measure pressure on the key up to 1020 dynamic levels, at a rate of 800 samples per second. It’s the same with the pedals. The system captures proportional peddling, for both pedals, at up to 256 positions, at a rate of 100 samples per second. The company recently opened an outlet where you may marvel at the technology, just outside one of Germany’s latest cultural wonders, the splendid Elbphilharmonie concert hall in Hamburg. 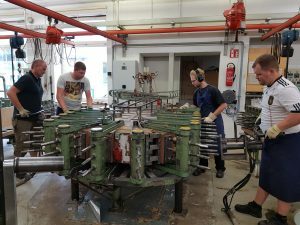 I was privileged to be given a tour of Steinway’s Hamburg factory this summer. Unfortunately there are no public tours. 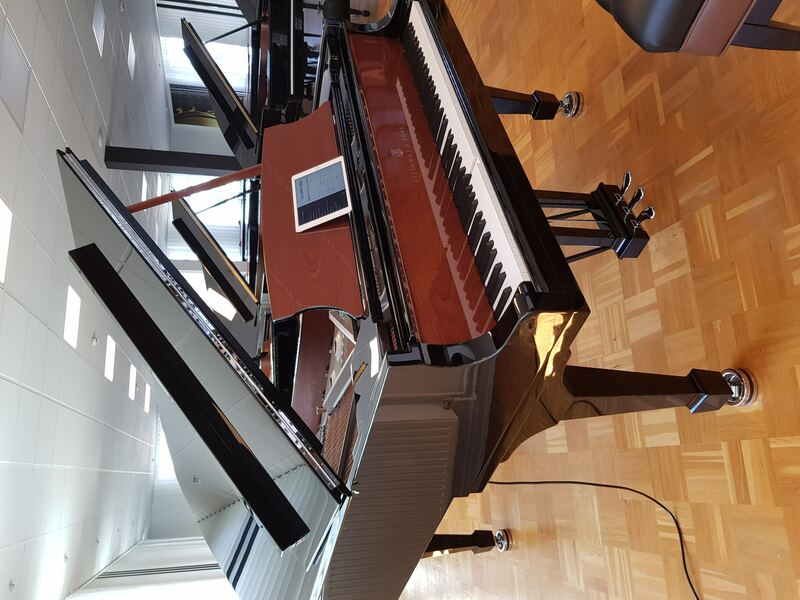 However you get to look around if you place an order for a Steinway – prices for the seven grand piano models and two upright piano models range from €35,000 to €159,000, with the Spirio-fitted grand coming in at around €108,000. 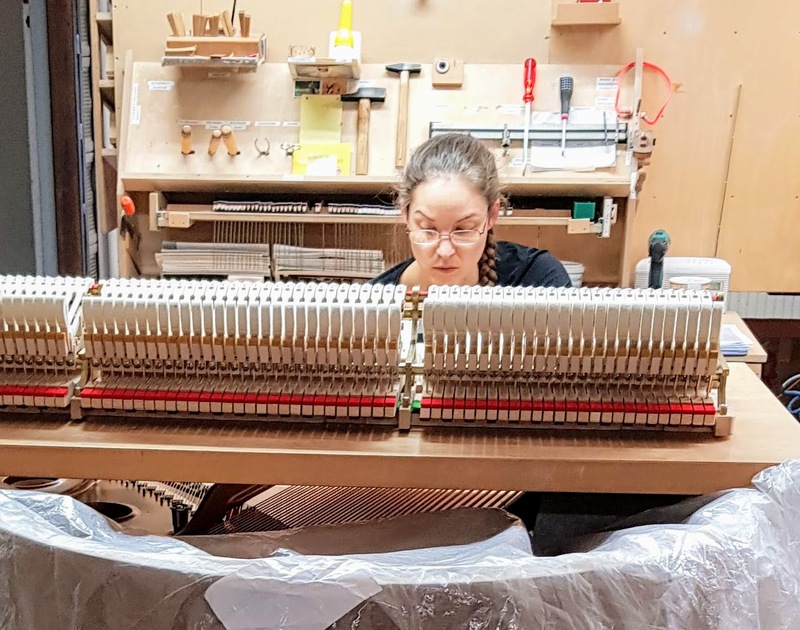 We saw the very start of the process, where up to 20 hardwood layers are bent and shaped in one piece – they use bubinga, maple and mahogany – to form the main case (rim) of the instrument. It had already taken two years to dry the wood. 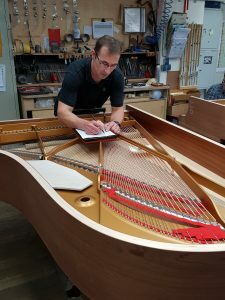 We passed on through the many stages of the construction, as the pianos, which each take about a year to build, took their intricate form before our eyes, through to the final polishing stage. The Crown Jewels range pianos have a diamond embedded in the fall board. But the Steinway is an attractive investment anyway; a piano made in 1985 and kept in good condition is worth 2.1 times more today. I never feel easy touring a factory, and looking at people at work. 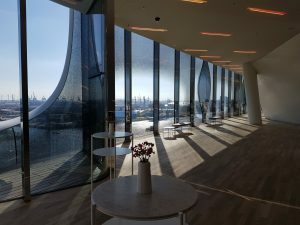 But the retention figures, and many of the 360 employees see this as a job for life, suggest that they feel fulfilled in their jobs. 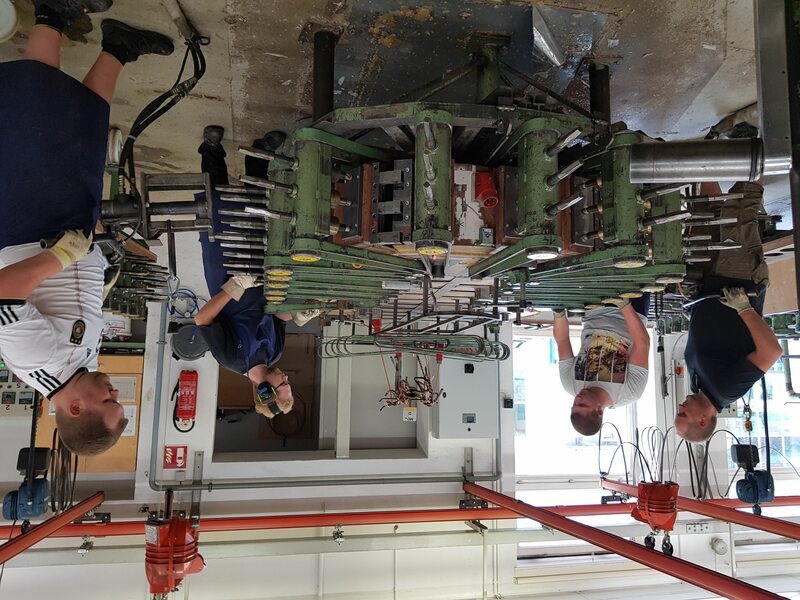 It is highly skilled and meticulous work, with around 80% of the manufacturing process carried out by hand. The Hamburg factory produces an average of 1200 instruments each year. We noticed a number of framed patents. Any firm would want to show off its research and development successes, but some of these date from the 1880s. There are 139 patents in all. The Steinway story begins in 1836 when Heinrich Steinweg built his first piano in the kitchen at his home in Germany. He and his family emigrated to New York in 1850 and founded the company in 1853 as Steinway & Sons. New York is still the company’s headquarters. 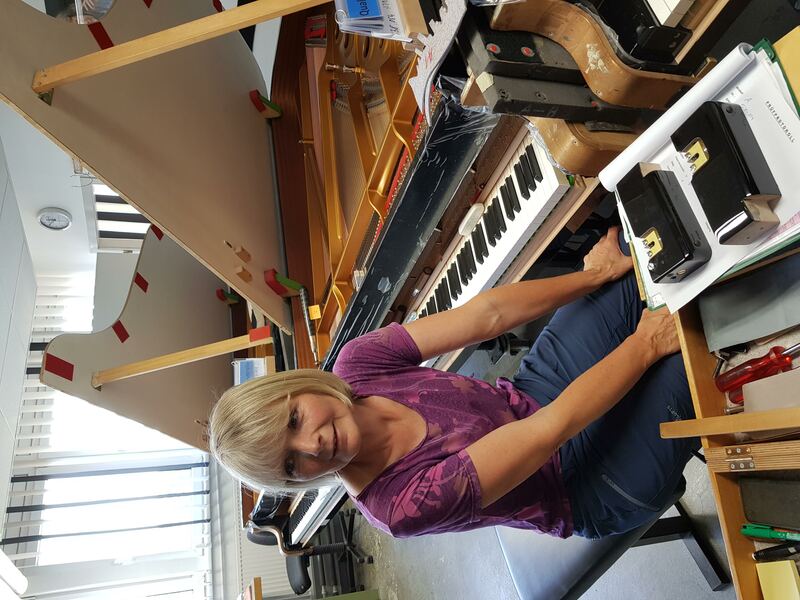 The company began making pianos in Hamburg in 1880. It opened its sales branch Steinway Hall in London in 1875. In truth Steinway achieved market dominance and product perfection quite a long time ago. Around 95% of the grand pianos you see on concert stages around the world are Steinways. The Spirio system (2015) was the largest product innovation in 70 years. The main landmarks are anniversaries. We were invited to Hamburg to note the 165th anniversary, marked with the release of a limited edition piano named, appropriately, the 165. It features the finest sapele mahogany in the music desk and the underside of the lid and key cover. And, of course, it has Spirio. Steinway also does a nice line in the passing numerical targets, the 100,000th, 200,000th et cetera, usually marked with a limited edition. 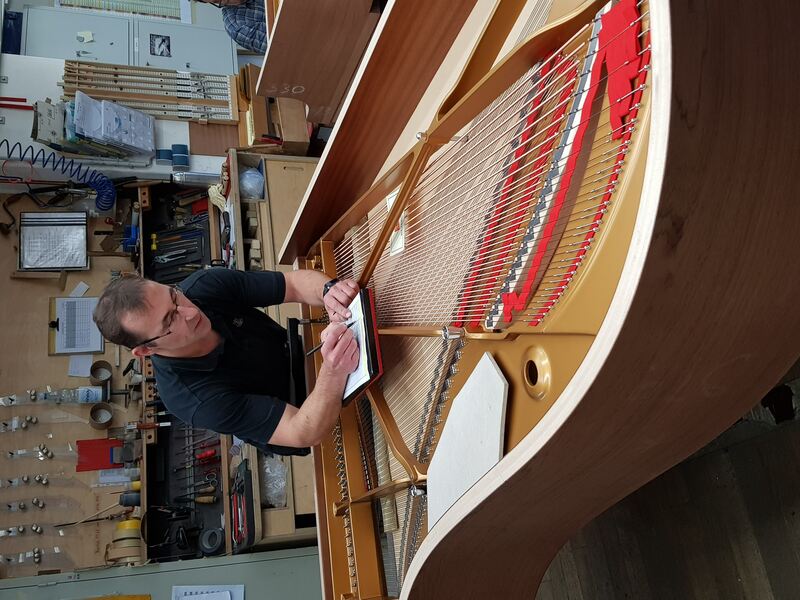 The 600,000th piano was built in 2015. Recently one was made to celebrate the 300th anniversary of the piano itself, and another for the what would have been the 70th birthday of John Lennon. It was white, of course. The company also marks big dates around employees’ accumulated years of service. Some quite high numbers, 25, 40 and even 50 years service, are commonplace. 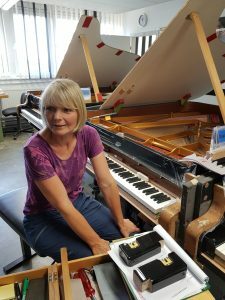 The person we saw the very end of the process, Wiebke Wunstorf, signs off the sound quality in the keyboard of every Steinway piano to leave the factory. She was the firm’s first female trainee, 39 years ago. Lots of people have rewarding jobs, but this lady’s must be exquisitely satisfying. The total of female employees has grown considerably since she joined the company. We concluded the tour in the company’s performance room. An adjoining corridor was lined with many Steinway Artists, from Benjamin Britten to Lang Lang, with their dedications. 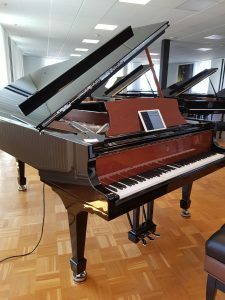 We were given our own private Spirio performance, and I discovered another remarkable thing about the technology. The development team has found a way of digitising the recorded performances of long dead artists, such as Glenn Gould, Duke Ellington and Sergei Rachmaninov, and their work are available on the Spirio playlist, delivered with the same impeccable level of authenticity which applies to the performances by all the company’s living artistes. I would not call it ghostly. I’d call it miraculous.